Max Perkins: Editor of Genius, by A. Scott Berg, arrived in my mailbox from a friend I know only from the Internet, because life is strange these days, with the intersections of the real and the virtual constantly confusing those of us who grew up in three-dimensional reality. I thought he said he was sending me a forgotten novel from the 1920s, so I was surprised to find a biography of someone I’d never heard of. I didn’t think I was in the mood for biography, despite the romance of receiving an unexpected book from a mysterious stranger in the post, so I began reading it out of a sense of obligation. At the time, I was trying to finish my first novel, and Max Perkins, who worked at Charles Scribner’s Sons for almost forty years, editing Hemingway, Fitzgerald, Thomas Wolfe, and many other luminaries of the 20th century novel, became my patron saint, secret friend, and ghostly counselor during the last phase of the process. His death in 1947 in no way diminished his importance to me over the final three months of writing and revising. 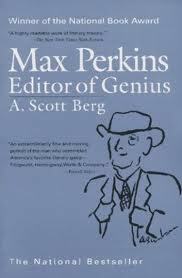 How could I not have heard of Max Perkins? How is it possible that I took course after course in literature, both undergrad and graduate, studied the authors Max introduced to the world–created, in one case–and still thought of these authors as self-made men, nobly sweating last night’s alcohol away at their manual typewriters? Were it not for Max Perkins, we probably would never have heard of F. Scott Fitzgerald, whose books neither sold well nor earned early critical success. Scott partied away his royalties when young, then spent them on his wife Zelda’s mental health care when he was older, but Max sent him loans from Scribner’s, or even out of his own pocket, just to keep him writing. Max caught what the critics missed about Fitzgerald: that he wasn’t just a spokesman for the Jazz Age, this new, unserious generation, but a novelist for America, for all time. Perkins persistently urged him to write, encouraging any new project, imploring him not to waste his talent. Fitzgerald died at 44, at work on his fifth novel. Were it not for Max, he might not have made it to his third, The Great Gatsby. Without Perkins, we certainly would never have heard of Thomas Wolfe, who wrote all day in longhand, standing up, using the top of his refrigerator as a desk, dropping each sheet of paper on the floor behind him as he finished. He wrote obsessively, chaotically, almost madly. He brought boxes of these anarchic drafts into Max’s office at Scribner’s, and the two of them spent hundreds of hours cutting and rearranging them into a novel. Max came to Wolfe’s apartment once, calmly informed him that his second book, Of Time and the River, was done, whether he thought he was finished writing it or not, and set him to work organizing the oceans of a paper into piles, which they later spent months shaping into a novel. Times have changed. The advice for new writers is never to show your work to an agent or editor unless it is perfection itself and you have tried it out on your own private focus group of readers who don’t love you enough to lie to you. Would-be authors mortgage their lives for MFAs, fly to conferences, practice their elevator pitches, build their platforms. Unpublished writers know (or pretend they don’t know) the truth: the world is full of writers. No one is waiting for your novel. If you died with your story untold, only the people who love you–and not even all of them–would consider it a tragedy. Max Perkins existed in a world where a book could matter enough to make his intensely personal interactions with his authors worthwhile. He fed them, sympathized with them, drank with them, and wrote them letters and telegrams telling them everything they needed to hear, which was really only one thing: The world is waiting to hear what you have to say. Don’t let us down. During the last three months of finishing and editing my novel, I pretended he was also speaking to me. This entry was posted in Books & Libraries, Criticism, Writing and tagged A. Scott Berg, authors, biography, book reviews, books, editing, Fitzgerald, Maxwell Perkins, novelists, novels, Thomas Wolfe, writing. Bookmark the permalink. We all need that wise friend of an editor who is a candid and gentle critic.